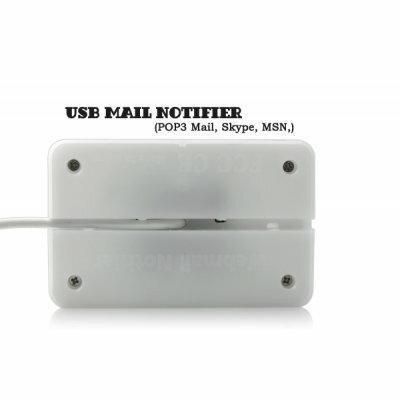 Successfully Added USB Mail Notifier (POP3 Mail, Skype, MSN Messenger) to your Shopping Cart. Mail and Chat notifier! This super cool computer gadget is just too good and is definitely a must have piece of tech. Perfect for the home and office, let this cool desktop LED gadget notify you when you get an email on your MS Outlook or receives a message on Skype & MSN Messenger. This cool LED gadget comes with a user friendly software that helps you set up your preferred settings, so that when an email is received via pop3 such as in MS Oulook, or a message Skyp or MSN, It will informs you by lighting up 3 different colors. E.g. - When Outlook receives an email, the Red LED lights up. - When MSN Messenger receives a message, then the Blue LED lights up. - That’s not all, you can even configure this mail notifier by selecting the color index (color grade) as to represent a certain number of unread emails, of up to 6000 emails. A true computer accessory that every desktop needs! Simply plug it to your laptop or desktop computer via a USB port, then insert the included software CD. Once the software has completed installation, you can start using your brand new LED mail notifier. A perfect gadget just in time for the busy shopping season coming up. Display this cool product on your drop ship website or eBay resale listing, and start making some serious money. Of course, this cool tech is brought to you at a wholesale price so that you can add your own profit margin to make your self a worthwhile profit. This mail LED notifier is brought to by the leading electronics provider in China electronics - Chinavasion. Click "Add to Cart" now, and we'll express ship you a sample straight away to liven up your work desktop. Does this Mail Notifier also worth with other chat applications such as Yahoo, and the famous Chinese chat application QQ? No, this USB mail notifier is designed to work only with POP3 supported applications such as MS Outlook, and with Skype and MSN Messenger.